Before the Paris attacks it was our responsibility to ourselves to visit Paris because it is such a wonderful, magical city. After the attacks, we have a moral imperative to stand with Parisians of all faiths and backgrounds in support of the city’s enduring principles – love, understanding, tolerance, beauty, liberty, equality, and sorority. As long as you will now be going, I beg you to enjoy my three favorite eating experiences in Paris. Do all of these in one (long) day if you must, but please do all three on your next visit to Paris and report back. 1. Get macarons and the candied rose croissant at Pierre Hermé, 71 rue Bonaparte. You should arrive at 10 AM when they open (you can go for a run in the Luxembourg gardens before and finish your run at Pierre Hermé). Pierre Hermé compared to Ladurée is like Ladurée compared to McDonalds. 2. Lunch at Dessance restaurant at 74 rue des Archives in the Marais. It is a spectacular dessert-based menu, but all of the items are not sweet. Ask for Felix and tell him I sent you. You must get the six course hedonism menu. It is spectacular and shockingly inexpensive. 3. Dinner at Le Récamier, 4 Rue Récamier, the greatest soufflé restaurant in the world by far. 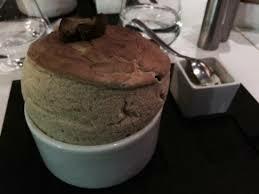 Get the beef and ginger soufflé as your main course and then the salted caramel soufflé as dessert. Trust me.